These cold frosty mornings, such as the one I awoke to today, always remind me of the days my mother spent in the Brook hospital in Shooters Hill, towards the end of her life. The poem below was written immediately after visiting her one day in the hospital when I, like all her children, had been stunned by her sudden decline. The accompanying photo was taken two years earlier, around the time of her seventieth birthday and that is how I like to remember her. She was born in Tralee, Co. Kerry in 1922, and her family emigrated to Welling in 1937, for reasons I never fully understood. From the photo it can be seen that even at her age then, she had lost none of the beauty that led my father to call her his Rose of Tralee throughout their life together. But the radiance of her physical beauty was nothing compared to the inner beauty that glowed within her and was manifest in her eternal smile. 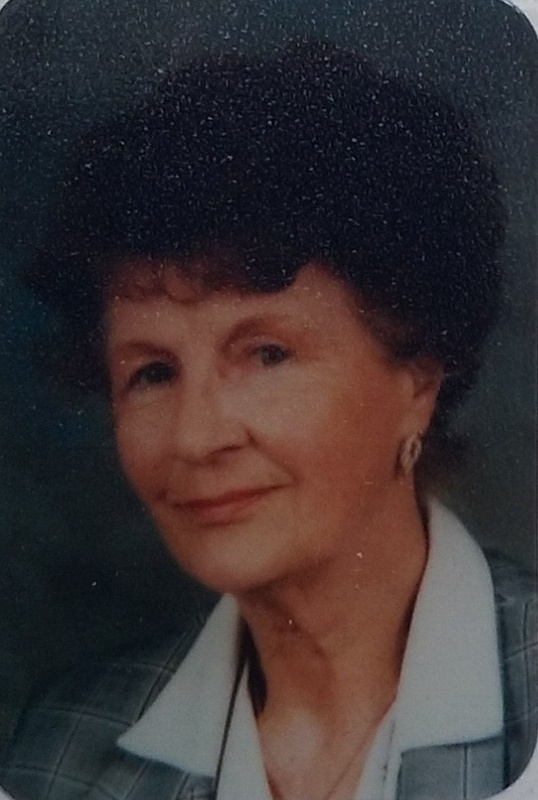 She was blessed with the tough genes of the Kerry people and she worked tirelessly throughout her life as a proud wife and a mother of six and as a teacher of primary school infants. In so many respects she was the life and soul of the family, and if I had to sum up in one word what drove her to embrace life with such inexhaustible energy, I would have to say love. in the ancient woodlands by your last bed. in the half-light of the half-moon. under the half-moon. And then silence. And then peace. A ﬁnal flurry of snow. That you should love and be loved. and not the one without the other. in the giving and receiving. barely three and forty years from here. as the mother and daughter of my love. that never-losing-you life of your death. at the breast of your love. In this photo, which I’ve used in a previous post, I am sitting in my highchair, aged eighteen months. Behind me you can see the door to the shed where my father kept his gardening tools, especially the lawnmower, along with some of the army debris he brought back with him when he was demobbed, his collapsible canvas camp bed, for example. There were boxes containing spares for his motorcycle, spark plugs, replacement lamps for his headlights. His Wellington boots always stood just inside the door and I would often take them out and totter around the garden wearing them even though they came up to my thighs. The shed has lots of memories. It was lit by a single bare electric light and it was always damp inside. It had been built in 1947, at the same time as the house we lived in, but the builders had rushed the shed and forgotten to put in a damp course which meant that humidity rose up through the bricks and the door frame was rotting and hinges were rusting. The shed window consisted of four panes of glass, two of which on the part of the window that opened, were cracked ever since I could remember, and were never replaced. The flowerpots on the sill are testimony to my father’s abiding passion, which was cultivating his garden. He grew vegetables, beans, tomatoes, as well as roses and a whole variety of seasonal and perennial flowers. He loved to sit in his garden at the end of a long day and smoke his pipe in silence contemplating the handiwork of his green fingers. Gradually, over the years, the garden evolved, as the family’s financial circumstances improved, but he never stopped adding new features, a watercourse, a greenhouse, new varieties of rose. It was his principal relaxation. You can barely see it, but behind the pram on the left of the photo there is a door to another part of the shed, which was a separate storage area. It had several wooden shelves inside and there my father would store the apples from our many fruit trees and which we would consume in the course of the cold winter months. 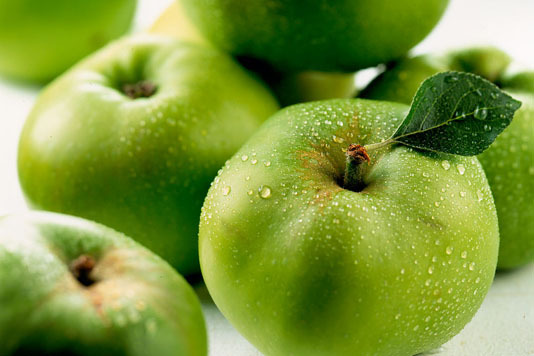 The most productive tree was a Bramley which bore beautiful, huge, slightly tart apples which were ideal for apple pies and crumbles, two of my father’s favourite desserts and which my mother cooked to perfection. The pram itself is interesting: if I was eighteen months old, my brother Michael would have been a baby and was therefore somewhere in the house in his cot at the time of the photo. When we shopped with my mother I would sit in the pram with Michael and she would wheel two miles up Gravel Hill to the nearest shops in Bexleyheath. We went there to buy cheese and meat which was still rationed after the end of the Second World War until rationing was finally abolished in 1954. There was also a sort of community hall behind Christ Church, an Anglican church on the Broadway, where families with young children went to collect their free concentrated orange juice. When Mark, my second brother was born, my mother would sometimes take all three of us in the pram, but eventually I was big enough to walk by her side, holding on to the pram handle. Large-wheeled, well-sprung prams went out of fashion when the Maclaren stroller or foldable buggy was invented in the mid-1960s, but nowadays fashion has changed and these beautiful, sturdy, hand-built wooden prams are once again in demand. When Mark was a baby he would often sleep in the living room in the pram during the day and when he woke he would find a way to rock the pram so that it travelled the length of the living room and back. I can remember the living room walls were deeply scored by the knobs on the side of the pram. When I was a little older I would often keep tabs on my father who at certain times of the year would disappear into the shed for hours. One evening in mid-December, I put a chair outside the shed window so that I could climb up and peer in. There I saw my father working away at a wooden fort or stockade that he was building for my brother Mark as a Christmas present; it was his own design, the pieces of which he had shaped with a tenon saw before gluing them together. When he noticed me, he called me into the shed and made me promise not to say a word to my brother. The next time I saw the fort it was being unwrapped on Christmas morning. I mentioned the American short story writer, Raymond Carver in an earlier post. The title of one of his stories, “What we talk about when we talk about love”, has always stayed in my mind. Most of Carver’s stories talk about love, and in this particular story the examples of love all appear to be dysfunctional, raddled by drink. The love I witnessed between my parents was quite the opposite and it has always been for me exactly what I talk about when I talk about love. An example of this love can be glimpsed in an extract from a letter my father wrote to my mother early on in their marriage, but the feelings it expresses were reciprocal and never diminished, never dated. My parents were not what I would call outwardly sentimental in their devotion to each other, they were simply devoted. There was always humour, and always love. 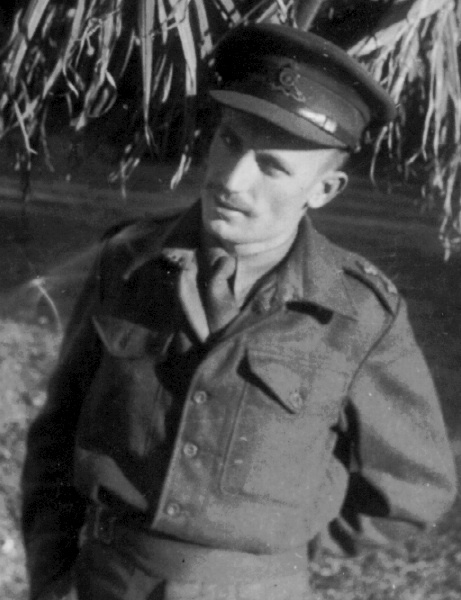 The context of the letter is as follows: in 1946, my father, then a Captain in the Royal Artillery, found himself posted to Egypt. He’d married my mother in Belfast in 1944, and my oldest sister, Annette, had just been born. Omitted from the letter is the substance of my father’s meeting with the Colonel he mentions: this was to discuss his future intentions now that the War was over, and whether he would remain in the Army. AEC 48 Canal Sth Dist. Yesterday I went to Cairo. It was an awfully hot day, and I sweated blood. First I went to BTE. I saw the Colonel. . . .
[. . . ] I had lunch and went for your shoes. Meech, the chap in my tent and I searched I don’t know how many shops. I couldn’t find the exact copy, tho’ I could have had them made for £4. However, I thought that you didn’t necessarily want white, as in the picture, but that type. And I thought, pure white would get dirty (practical eh?) so I would buy you a pair you could wear with anything, and would look smart as long as you had them. I think they’re lovely, and I saw nothing like them in any of the shops I called at. The same shoes would be hard to find in England, and be quite expensive. They cost £3-7-6! So they are not a cheap pair. They have cork inside, so they should be very comfortable. Tomorrow I will have them sewn up. I also have something else for you —— something of my own —– I didn’t buy it, so don’t expect anything like that. It’s something special. Not very good, but it’s what it means. You’ll understand, you’re like that. And I love you very much, my dearest —- adore you. I think you’re the most beautiful adorable girl in the world. That’s what my present depends on. It isn’t good but it comes from me as a token of my love, my devotion, and a tribute to your beauty, darling Marie. How are you feeling, and how is the darling baby? Do write to me soon, darling, only a line. Because it means so much to me to hear from ‘you’. Oh if you knew how much I love you darling. But I think you know a little about it. You are my whole life, my dearest. God bless you, my darling love. My father was an exceptionally gifted man. He taught English and History in secondary schools for most of his life after being demobbed in 1946. In addition he was a trained violinist and had played in an orchestra in Woolwich while he was a student at Goldmith’s College before the War. He wrote reams of poetry, mostly dedicated to my mother, and he was also an accomplished artist. I remember that with a friend, he used to attend evening art classes in Bexleyheath run by Mr Stutz, an old Austrian Jew who like so many of his compatriots had fled to England in 1938 to avoid the Nazis. Stutz lived with his Austrian wife on Watling Street in a rather sombre house on the opposite side of the road to St Catherine’s School. Going into that stuffy and dimly lit house as I often did with my father, was like going into another world. It was full of art objects and paraphernalia some of which Stutz had collected and some of which he had made himself. On each visit, he would give me hundreds of stamps for my collection and on one occasion he also presented me with a Meccano stationary steam engine that functioned with a small methylated spirits burner under the water tank, for a long time my pride and joy! Over the course of a year or two, our house began to fill up with artefacts manufactured at the classes run by Mr Stutz. There were coffee tables covered in mosaic, there were ornamental plates and dishes with designs my father had drawn, there were portraits of St Thomas More and St John Fisher which he transferred onto tiles to be glazed and assembled and which were eventually donated to the respective churches. 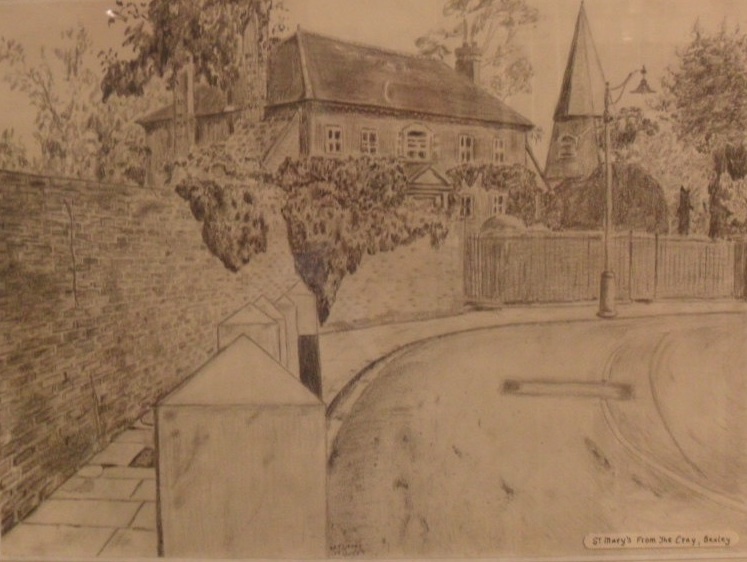 And when not at his art classes my father sculpted using wood off-cuts, and he also loved to draw local views, such as the one illustrated, a view of St Mary’s Church in Bexley village. It was to this church that William Morris, at the time a Bexley resident, took his daughter Alice to be christened in 1861. For these drawings he would usually work from photographs, but one summer we all went out with him to the five-arches bridge in Footscray where he set up an easel to paint a view of the bridge in oils while we played in the fields. The photo I always use as wallpaper on all my computer screens was taken by my father, one summer’s day when he decided we would all have a picnic outside instead of eating in the dining room. I’m sitting in a high chair close to a table where my three sisters are patiently waiting for their lunch. 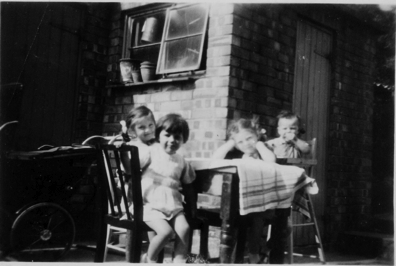 In the background, the old brick shed and the old pram which saw such good service, there being six of us children in total. I must have been eighteen months old at the time, as you can probably tell from my lack of hair. Looking a little fed up and probably hungry, Shevaun is sitting on the side of the table closest to me, and opposite her, smiling, are my two other sisters, Annette, the eldest, and Mary. Mary is in the foreground, closest of all of us to the photographer. She is wearing a short summer dress, undoubtedly home-made, and she has turned in her chair to look straight at my father. For me this picture is particularly poignant, given Mary’s eager posture: she is the only one of my siblings to have already died, and it is almost as though she is leaning slightly forward to say bravely, “I will go first into that unknown country.” I keep this wallpaper so that every day I will remember her and she will know she is loved and missed now as much as ever. Although my father always treated us equally, Mary, his youngest daughter, was probably the apple of his eye. The photo is also important to me because it captures the first real and vivid memory of my childhood. My father was standing at the bottom of some steps, which led up to the space where he had laid out the table, and then to the right, the garden beyond. Behind him was the back door into the kitchen where my mother was preparing lunch. The table had been made by my father. He found the legs somewhere and a large rectangular piece of flat wood to make a top; you can tell this simply by looking, because the colour of the surface is different from the stained legs. There is a cloth on the table, which heightens the suggestion of a picnic. We rarely ate outdoors, but this was an exceptionally warm day. So there is novelty in the situation, an improvised gesture of parental creativity which was typical of my father, his trademark in fact. On that day I clearly remember my father disappearing after telling my mother he wanted to take a picture, and when I heard this I began to get upset. I’m sure I bawled out something like: “No time for photos, I want my dinner.” But probably my words were far less articulate than that and more strident. My right hand is hidden by Shevaun’s head but in it I was holding my spoon and I kept banging the spoon on the tray of the high-chair as I shouted out, demanding that my dinner be served. We always used the word dinner for lunch when we were small. My father returned shortly after, brandishing his Kodak, and with a broad grin, told me to calm down and to sit still for the photo. “It’ll only take a minute, John. Lunch won’t be long.” I was not easily appeased in those days, I remember, not where food was concerned. But that cherished minute has long gone! Only the photo remains.